Last year, I decided to take LibraryThing's challenge of reading 50 books. I got pretty close, but didn't quite make it all the way. I think I was mostly on track until about the last three months of the year when I started getting a lot of consulting work. Still, I did read 43 books, which I think was a lot more than I had read in previous years. That in itself makes this exercise a win for me. I think I settled into a nice rhythm, and started to recognize that when my reading slowed it wasn't always because I was busy doing other things. Sometimes the book just wasn't that good, and reading it was bringing me down rather than exciting me. Those times I stopped reading and moved on to the next book. Looking at the complete list of books I read in 2010, all but one were fantasy. The loner in the group was Marley & Me by John Grogan, which I highly recommend, especially if you're a dog lover like I am. This was actually the first book I ever bought after having seen the movie of the same name starring Jennifer Aniston and Owen Wilson. The movie was surprisingly good, and the book was even better. We have two dogs, one which is beginning to get up there in years; watching the movie and reading the book gave me a sneak preview of sorts concerning what to expect once 'my girl' finally does go to doggie heaven. Other notable books included novels in the Overworld series by Jack Vance, The Gunslinger by Stephen King (which I thought was good but gave up on the series after reading the second book), a lot of the Tor.com free eBooks (which were mostly forgettable), as well as a number of books by Dave Duncan, all of which were excellent. First off, I'm dropping LibraryThing. I was trying to maintain accounts with both LibraryThing and GoodReads, but since the latter is by far the better site and I'm starting to build a book list as well reading relationships there, I'm 100% GoodReads now. Stop by and add me as contact if you want. As for reading, I'm again going to engage in a reading challenge for 2011, but with a more modest goal of 35 books. I'll track this through GoodReads on my 2011 Reading Challenge page. I've got 3 books down already, with more to follow. Last, I'm going to scale my book reviews down a bit for this year. I wrote a lot of reviews last year, so many that they were becoming a major consumer of my time. So, this year expect a lot less reviews. I'd entertained thoughts of starting my own f/sf review web site, but it's hard to add anything else to my workload right now. This segues into where that time is going to get reallocated, and that is towards the sale and marketing of my two novels as well as what is looking more and more like a sequel to The Five Elements. More on that in another post. 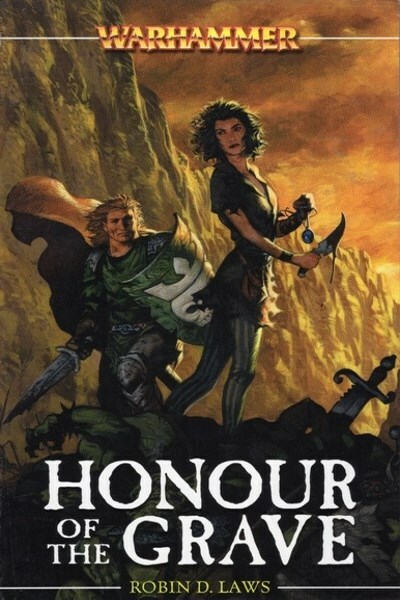 Honour of the Grave by Robin Laws is another book that didn't do it for me. Unlike the last couple of books that I gave up on fairly early on, though, this one had me until one of the characters did something that I felt was completely out of character. Unfortunately, this event was jarring enough that I had to put this one down. This novel is part of the Warhammer series of novels. I haven't read enough of them to know what order this might fit into or if there is any order to them at all, but the novel seems to stand alone. This is actually the second Warhammer novel I've reviewed. So where did Honour of the Grave go wrong? It's when Angelika, who is a grave robber by trade, betrays her very nature by saving a young noble whom she knows will be killed once she hands him over to his rival brothers. Rather than taking the bounty, leaving the lad to his fate, and riding off to her next adventure, she snatches the young lord from the clutches of death and so makes herself some very powerful enemies, not to mention causing herself to stand out in a way you wouldn't think a grave robber would relish. I wasn't alone in this opinion of Angelika as evidenced by the reviews on Amazon. Unfortunately, what started as a fun fantasy romp fell flat when stood up against Angelika's bizarrely shifting personality. I couldn't put my finger on it, but something about Starfish by Peter Watts just didn't do it for me. Perhaps it was the flat characters. Or the proliferation of dialog with little descriptive text or explanation as to what's going on. Or maybe it was the droll story development. Whatever the case, I didn't get very far in when I started to feel thoroughly unenthused about going on. I've found through personal experience that when I'm not excited about reading a book that it then becomes a chore or requirement that I continue reading. In my younger days I would accept this but soldier on anyway. Nowadays, my time is too valuable; there are too many good books out there to spend time on one I have to force myself to read. 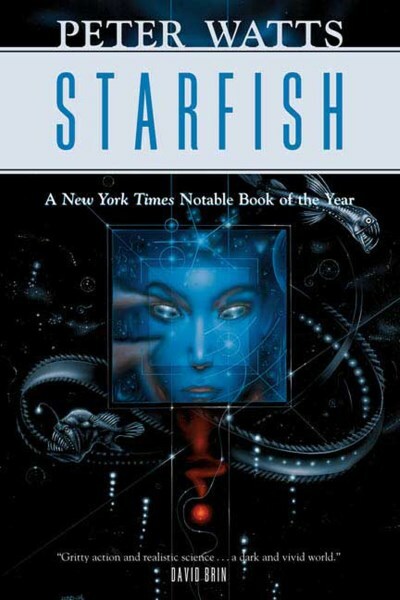 That aside, Starfish was well-written, and I wonder if the author had jumped into the central story (whatever that may be) sooner then maybe I'd be writing this review giving the novel if not a thumbs up, then at least a more thorough review. Wit'ch Fire by James Clemens is one that I just couldn't finish. In fact, I didn't get very far at all with it. The story begins with a foreword; never a good sign. Info dump (i.e., background story of a bygone era where bad things happened) ensues. The problem with a forward like that is that the reader isn't invested in any way: not in the world and certainly not in the characters. I'll admit I skimmed through most of it. Then the story begins. The writing is competent enough, but, ah, the story. It's your basic farm boy girl who discovers she's the heir to an ancient power that if she learns to control will no doubt save the world. Someone is after her, too, which I suspect means she'll have to flee and will probably meet some nice people who will help her not get killed, or something. 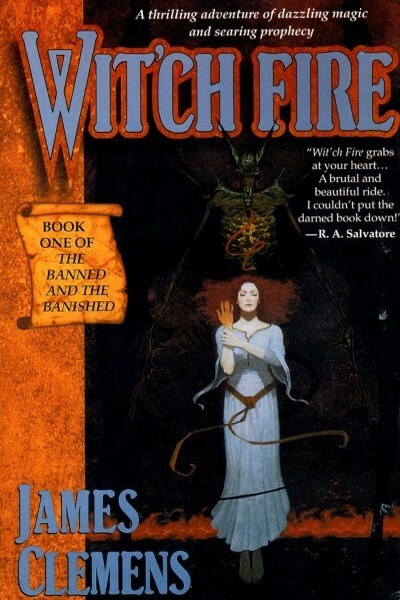 Wit'ch Fire was published in 1999, which is about the time when these sorts of tales were beginning to go out of style. Perhaps if I'd read it back then, I wouldn't feel so detached from it. Perhaps it would have grabbed me and not let go. Perhaps, or perhaps not. In any case, chalk Wit'ch Fire up as a "not finished." Dragon Haven by Robin Hobb concludes the story begun in Dragon Keeper, book one of the Rain Wilds Chronicles. 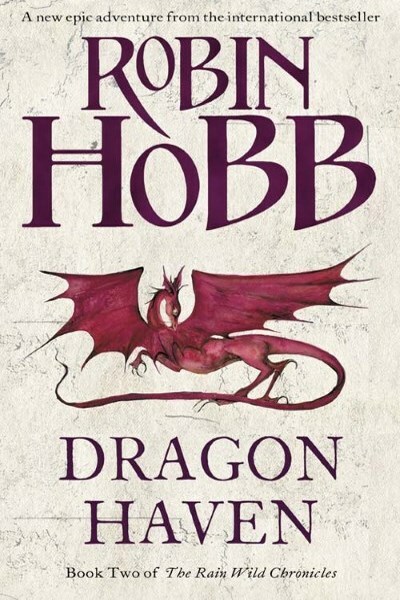 Word is that Hobb wrote this series intending it to be a single novel, but given it's length the publisher decided to split it in half (Robin Hobb informed readers of her blog that she is, in fact, working on a third book in the series). The result is that Dragon Keeper doesn't exactly leave us hanging or wanting to rush out to buy Dragon Haven (I didn't, but that was more about the then eBook price of $14.99; I finally bought it for $9.99). But, all that aside, I still was looking forward to getting my hands on this one. The Rain Wilds is something Hobb has delved into more and more in each successive series of hers. These two novels delve deeper still. Whereas Dragon Keeper was about stunted dragons choosing keepers for themselves and the beginning of a journey to find the lost city of Kelsingra, Dragon Haven is about the continuing angst and trials between the dragons and their keepers and the conclusion of their quest. I'll leave it to the reader to discover if they find Kelsingra or not, but I would like to comment that Hobb, in her own way, finally explains the acidity of the Rain Wilds River, something that has played into many of her novels and defines the people who choose to make their homes at its banks. In terms of writing, it's hard to complain or find fault with Hobb. She's a wonderfully competent author who has a knack for developing rich characters dwelling amongst a richer world. As is mentioned often about Hobb's writing, pacing is an issue. If you're looking for the latest Abercrombie-type novel, go elsewhere. Hobb leads the reader on a slow walk down a meandering path, tantalizing with hints of something more and just enough contention and challenges that when presented, you tend to want to see how the characters involved make out. Sometimes they win, sometimes they don't. The conclusion of the Farseer Trilogy still stops me in mid-thought sometimes and sends me into fits of melancholy. It's powerful stuff. If I were to say anything bad about Dragon Haven it's that we never get the level of tragedy I was expecting out of Hobb. It just seemed to me there were multiple points where certain characters could have come to serious harm or made to sacrifice, but those opportunities were passed over. While Dragon Haven is a complete tale, I couldn't help but feel that it is only a stepping stone leading into Hobb's next series. There's a lot of setup here, with some aspects of the Rain Wilds and dragons in general finally explained, but we're left looking into a horizon that is not darkening, but becoming brighter and wider. In any case, Dragon Haven will be going on my Favorite Reads of 2010 list.